Some people look at death with doom and gloom in their eyes. We get it. It's never going to be a happy event. But what about the glamour of the mystery that happens beyond the veil? This skull will make people feel a little more comfortable contemplating the dead. Who knows what waits for all of us? Death might be full of nights filled with glamorous death dances. It might be rich, lovely, and full like a bottle of mysterious red wine. You never know what it's going to taste like until you pop that cork. In the meantime, enjoy that bottle's label with this gorgeous, sparkling skull! This lightweight skull will make a gorgeous centerpiece to your October display this year. It has a wide grin and somewhat realistic details as well as a scrolling flower pattern that's accented with sparkling jewels. From gold, teal, and red you'll have all the jewel tones you need to add a lush quality to your Halloween display. Ready to level up this Halloween? Surround this skull with flowers and a set of LED candles from our Halloween decor catalog. 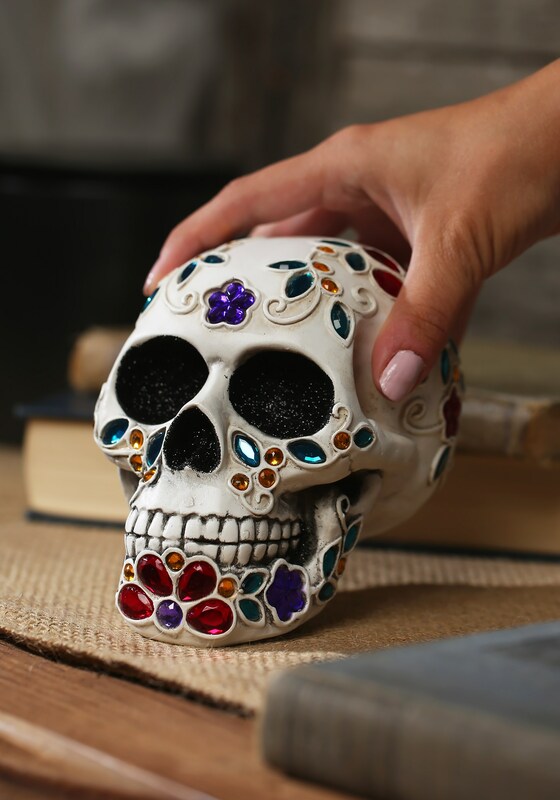 If the dead come to visit this spooky season, their sure to be flattered by this gorgeous skull!